Welcome back to Toy Aisle, io9's regular round up of all the shiny new bits of plastic threatening our bank accounts that we’ve seen on the internet. 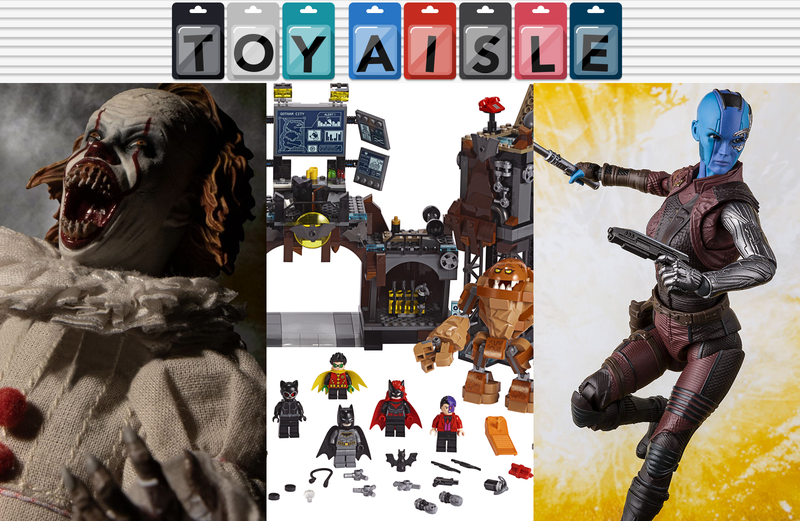 This week: Batman celebrates his 80th birthday the Lego way, Nebula strikes a pose with a new Figuarts toy, and the most perfect Teenage Mutant Ninja Turtles kitchen tool ever. Check it out! Although he doesn’t look a day over 35, tomorrow is Batman’s 80th anniversary and you can help celebrate the crime-fighting billionaire’s life by padding another billion dollar entity’s bottom line. Lego’s revealed six new sets, but the four you’ll want to focus on are the $20, 200-piece Batman Mr. Freeze Batcycle Battle; the $30, 342-piece Batman Batmobile: Pursuit of the Joker; the $50, 489-piece Batman Batwing and the Riddler Heist; and the $100, 1,038-piece Batman Batcave Clayface Invasion. As with a lot of Lego sets in recent years, these seem worth it for the minifigures alone, which include Shazam, Mr. Freeze, Damian Wayne, and Kate Kane as the Batwoman. We’re not opposed to paying a premium for a fantastically-detailed figure packed with lots of articulation and accessories. S.H. Figuarts’ new Nebula figure, based on her appearance in Avengers: Infinity War, ticks all those boxes with an alternate face, swappable hands, and a pair of weapons. But if you want to pre-order one today ahead of its September availability later this year, you’ll have to cough up almost $60 for a figure that stands less than 6 inches tall through Bandai’s premium web store. That doesn’t include shipping, or any additional costs of trying to get this shipped out of Japan where it’s an exclusive. Although popular among comic book fans for years prior, it was the 1990s animated series that really helped the X-Men x-plode in popularity. If that was your introduction to the characters, then you’ll undoubtedly recognize this version of Cyclops featuring his yellow and blue suit inspired by the ‘90s-era Jim Lee comic books. Medicom’s six-inch, $70 Cyclops figure, available starting in January of 2020, includes red sunglasses, a pair of optical blasts, and multiple visors with one even featuring a fun sizzle-effect. In 1992 it became prohibited to make or sell toy guns unless they were brightly colored, or featured a bright orange tip so they were easy to distinguish from the real thing. The toy industry embraced these regulations with over-the-top designs, but recently we’ve been seeing toy blasters drawing inspiration from the real thing again. Hasbro’s Nerf N-Strike Elite Trilogy DS-15, available come this fall for $35, features shells that are automatically ejected every time the priming handle is pulled back. It fires three darts at a time, and has storage on the back for additional shells, but they’re yet another thing you’ll need to hunt down after your ammo reserves have run dry. HBO’s more action-packed series are criminally under-represented in the world of toys. It’s taken six or seven seasons for decent Game of Thrones figures to arrive, but Westworld has fared a little better with collectibles arriving well ahead of a third season that’s hopefully still en route. Diamond Select Toys has a Westworld three-pack arriving in August that’s available for pre-order now from the Big Bad Toy Store. But $75 might be a little steep for three, 7-inch figures that bare only a slight resemblance to their characters. Dr. Robert Ford is a decent likeness of Anthony Hopkins, but Dolores and the Man in Black are even more of a mystery than the show.